During the last two academic courses I have made some collaborations with the Open University of Catalonia’s Business School and the joint project in e-training for unemployed people between this university and the Catalan Employment Service. I was asked — in both cases — to author some learning materials on Cloud Computing and Social Networking Sites. The target of the courses were micro-entrepreneurs in the former case and unemployed people in the later. Thus, those would be very short courses (usually 4 or 5 weeks long), that required very short time spans (people are busy running their businesses or looking for a job) and with special emphasis that they had to be really practical, avoiding theoretical digressions. In other words: useful courses for partial-time (even casual) learners. Social networking sites for unemployed people, in Catalan. Cloud computing for unemployed people, in Catalan. 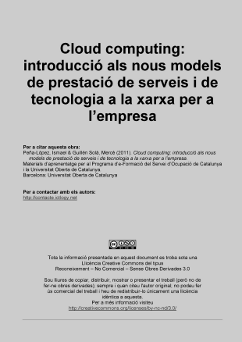 Cloud computing for micro-entrepreneurs, in Catalan. Cloud computing for micro-entrepreneurs, in Spanish. For those interested, you will see that while the Cloud Computing courses share some content, their approach is quite different, the second one (for micro-entrepreneurs) following the usual design of a (fictional) case-study. Mercè Guillén Solà, Ismael Peña-López (2011). “Xarxes socials i professionals a l’empresa“. Materials d’aprenentatge per al Programa d’e-Formació del Servei d’Ocupació de Catalunya i la Universitat Oberta de Catalunya. Barcelona: Universitat Oberta de Catalunya. Ismael Peña-López, Mercè Guillén Solà (2011). “Cloud computing: introducció als nous models de prestació de serveis i de tecnologia a la xarxa per a l’empresa“. Materials d’aprenentatge per al Programa d’e-Formació del Servei d’Ocupació de Catalunya i la Universitat Oberta de Catalunya. Barcelona: Universitat Oberta de Catalunya. Ismael Peña-López, Mercè Guillén Solà (2012). “Informàtica en núvol“. Materials d’aprenentatge per al Programa de Gestió i Direcció de Microempreses de la Business School de la Universitat Oberta de Catalunya. Barcelona: Universitat Oberta de Catalunya. “Computación en la nube“. Materiales de aprendizaje para el Programa de Gestión y Dirección de Microempresas de la Business School de la Universitat Oberta de Catalunya. Barcelona: Universitat Oberta de Catalunya. ICT4HD. Round Table. What is the role of private companies on Research in ICT4D? Round Table. What is the role of private companies on Research in ICT4D? Traditional development has a very top-down approach, with international agencies funding projects, often with sting and debt attached, difficult to manage (e.g. corruption) and usually with little role for high technology. This just does not fit ICT4D projects’ necessities and way of proceeding. Cellphones’ evolution was very different: driven by bottom-up demand, because of the ease of use (voice), a dire need for communications (work, remittances…). Remittances to Africa are circa US$40B and imply much more money than the one involved in aid. This should give an idea about the power of microloans. The Grameen Bank is owned entirely by the poor and has loaned more than US$3.9B. It is mainly used for very short run (up to 6 months) loans, aimed for instance at buying a goat that will pay back the loan with its milk, or paying for seeds that will pay back the loan once harvested. Loans are chained one to the next one and create an important funding and cash flow. Grameen Telecom allows people to buy phones and rent them to their neighbours. The project covers 50,000-68,000 villages and 60M. The most important thing is that it scales and that the owner (the ‘phone lady’) is indeed interested in the maintenance of the equipment and the sustainability of the system. Another example: I.T.Mountain.BPO for medical transcription: voice in, text out for medical issues. The real digital divide is between urban and rural areas: for instance, the mobile phone is an urban phenomenon, as many rural areas have no cellular coverage. We need to bring connectivity to rural areas, and here is where WiFi comes to the rescue. It has already been demonstrated that the problem is not distance, but line of sight: you can send a signal as far as you can (literally) see. We need to find natural towers (e.g. mountains, hills) to be able to see further. Aravind Eye Hospital Network: doctors stay at the hospital, patients stay at their homes. 4-5Mb/s per link, video-conferencing — high quality and video are important because the interview really matter —, e-mail, training. Achieved 6,000 consultations/month, over 160,000 patients so far, centers are cash-flow positive, over 30,000 patients have recovered sight, growing to 50 centres covering 2.5M people and possibility to replicate in other cities. SmartPhone diagnostic device that, connected to the audio jack (and phones are good at converting analogue signals into digital ones), can provide measurements on heart rate, respiratory rate, temperature, blood oxygen, ECG, fetal heart rate or even blood pressure. The result is a much much cheaper and easy to use diagnostic device. The phone can either convert the raw data into readings of forward them through the GSM network. CellScope: Cellphone Microscope = (phone) camera + big lens. Its use can be to diagnose malaria after a blood sample is put under the cellscope. m-Learning: teach English via smartphones and by using educational games. Games have to be based on traditional local games to provide the learner with a familiar and thus understandable context. Fernando Balducci: we definitely have to avoid the confusion between tele-diagnosis and self-diagnosis, which is a hazard we might run into when such tools become more and more present in end-users’ hands. Javier Simó: concurrence or cooperation? A: concurrence, but informed concurrence. Every place is different, so solutions cannot be replicated in a strictly straightforward way. And for being informed, a certain degree of cooperation is required. Q: what about call centres? A: a call center requires connectivity, low power, simple infrastructures. So call centres can be a good way to start to create employment in rural areas. But we should be beyond that (including going beyond software development centres). David Chávez: smartphone or cloud computing? A: it is very likely that computing power of the phone will increase at a faster path than mobile broadband will. Thus why latest developments have gone into the direction of making the phone perform more work than instead sending to and fro data to “computing centres” to perform these tasks. Vanessa Frías: how is assessment performed in smartphones? A: within the traditional education system, this kind of assessment is very difficult, as it often implies interaction, synchronous meetings, etc. This is why vocational programmes generally work better than for-credit educational programmes. Indeed, there are other security- and privacy-related issues that are still difficult to handle in m-learning. The ICTP-UNESCO Wireless Training Kit has been approved by the International Telecommunication Union and it is aimed at training people in developing countries so that they can install and manage wireless technologies. It is developed by Rob Flickenger, Carlo Fonda, Marco Zennaro, Ermanno Pietrosémoli and S.M. Radicella. Cost-effective ways to provide connectivity where other usual technologies — e.g. fibre — are difficult to deploy. Operate in a wave spectrum that is free in most countries. Interference issues are less severe in rural areas, where there actually is less supply of telecommunication solutions. WiFi was designed for short distances,, but with some firmware modifications, it can be used in longer distances, achieving a maximum of 382 km. One of the main advantages of WiFi-based technologies is that they can be managed and maintained by the local communities themselves. The training kit includes all the devices and materials needed to run a training workshop on wireless networks. It also includes electronic books, support materials (slides, guides, exercises), WiFi devices, antennas and other equipment to run a full training course. The cost of the kit was initially 1,000€, but all the “software” (including learning materials) is freely available on the net. And the hardware can be built and/or distributed by many agents, hence the cost can even be reduced. Repository with open materials related to training on wireless networks: WirelessU.org. Book: Flickenger, R., Aichele, C. E., Fonda, C., Forster, J., Howard, I., Krag, T. & Zennaro, M. (2006). Wireless Networking in the Developing World. Morrisville: Limehouse Book Sprint Team. Valentín Villarroel: who is the toolkit aimed at? Ermanno Pietrosémoli: especially trainers of trainers. On the other hand, it is also aimed at communities that already have some basic structure and can dedicate a person to these matters. The Xarxa Òmnia is the largest network of telecentres in Catalonia and one of the largest in whole Spain. The network was set up in 1999 and, since its conception, it has always had a strong community-focused aim which made of their telecentres — or Punt Òmnia [Òmnia Point] — more than just public Internet access points, but more tools of (e-)inclusion and community building. Now that Xarxa Òmnia has turned 10 years old, the yearly rendez-vous of the whole network, the Jornada Òmnia, will focus on how should the network evolve in the coming years, taking into special account the changes that have been happening in the last 10 years in matters of the Information and the Network Society, and what are the challenges that policy makers and telecentre administrators will have to face to successfully fight the digital divide and the risks of (e-)exclusion. People not online are, increasingly, people actively refusing to be online. While it is still true that many people don’t go online because of impossibility to access the Internet (hardware, connectivity, affordability, skills, etc. ), we also find people that being able to access it, just don’t want to or even walk out of it. Lack of awareness, belief that ICTs bring nothing good to their lives, technophobia, etc. are keeping them disconnected and in risk not of e-exclusion but exclusion at all. The effect of these three aspects, puts at stake institutions? Do schools, firms, governments, the media or civic organizations still have a role in mediating between citizens? Or will citizens bypass them? What if they do? What if citizens themselves are bypassed by their peers? If hierarchies and institutions give way to — or are deeply transformed by — networks, inclusion will be a matter of staying connected and being able to re-program oneself to be kept within the network. New (digital) competences will be crucial for that, from technological literacy to e-awareness. Thus, we might be needing to reframe our policies and foster pull strategies instead of pull strategies; we might also reconsider the role of our (e-)inclusion tools (telecentres amongst them), that might need shifting from the “e-” to the “inclusion”, strongly focussing on community building, enhanced by technologies. I want to thank Cesk Gasulla, Noemí Espinosa, Marta Jové, Sònia Castro, Dolors Pedrós and the rest of the organizing committee for the invitation and the valuable chance to organize my reflections and think aloud in public. Moltes gràcies!